Kilkenny Team Trial League Open! 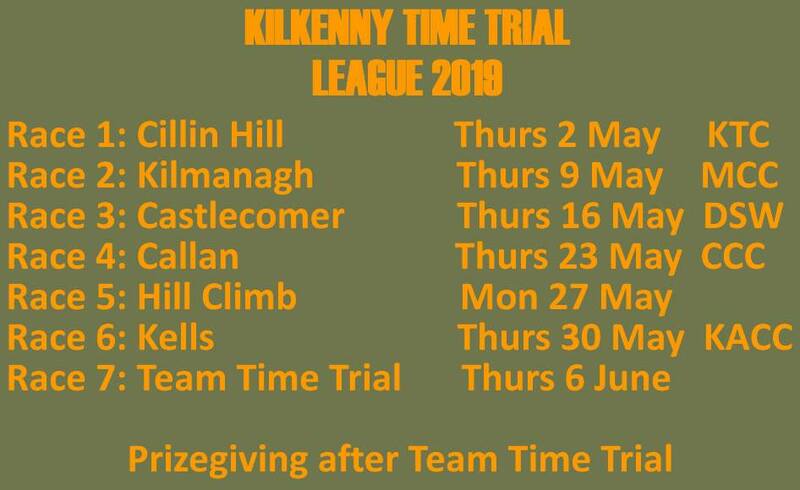 The Kilkenny Time Trial League is an annual cycling league run by Kilkenny’s four largest cycling clubs and Kilkenny Triathlon Club. Each club hosts one event in their locality and a sixth, hill climb event is jointly organised. Competitors start at 30 second intervals and are individually timed on the route. Times for each event are ranked and points are assigned to form a leader board. The final event of the series is a team event, where each club submits teams of up to five members each. Members of all five clubs are welcome to participate to either challenge for a top place or simply challenge themselves. Prizes are given in a wide range of categories and all are welcome to participate. To compete for a full finish we expect participants to take part in 3 of the 6 club races. Entries open : €15 gets you access to all the events.